An array of fans, pundits, journalists, bloggers and even players came together on Friday night to celebrate the year in football. From around the country some of those most passionate about the game united through the Footy Fans Down Under 2011 Awards Ceremony. Click here for all the pictures. Long term ambassadors of the game Les Murray and Michael Lynch received top honours, winning ‘Blogger of the Year’ and ‘Football Writer of the Year’ respectively. What a great platform in which to acknowledge their contribution to football not only over the past year but throughout their entire careers. It was also good to see the achievements of Australian Football Facebook, who reached thirty thousand followers whilst the awards took place, recognised. The page took out ‘Best Use of Social Media’, deserved winners in the end (founder Brian Gibsonr, wrote a particularly long winded speech which would have been quite the waste of time had they lost. Conversely The Football Sack wrote nothing, unless you count the doodles on the table napkins that read simply ‘Forza The Sack’). The presence of social media in the football landscape is continuing to increase, a point highlighted by the story of the evening’s hosts Footy Fans Down Under. “When we first launched the Awards initiative we were obviously nervous as to how it would be received but this was quickly put to bed at the first nomination stage followed by exceptional numbers during the online voting period” said Lee Sutherland after the ceremony. Head of FFDU, Lee Sutherland can contribute much of their success to Twitter. It has helped bring together what has at times been a fractured football community – allowing discussion, banter, social conversation, and most positively for FFDU, networking. “Social media has been a major factor helping us for the awards to get not only fans involved but TV, Print, Clubs etc helping to create a great atmosphere online which as you could see was replicated on the Awards evening”. Lee has built relationships with some of Australia’s most prominent football pundits through social media and used these to engage fans in various capital cities via FFDU hosted fan forums. 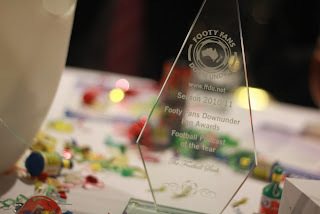 Following the success of these highly popular events, it is no doubt clear that the Footy Fans Down Under Award Ceremony will become a highly anticipated part of the footballing calendar for years to come. “Given the feedback we have had we can view the Fan Awards as a success and roll on 2012 when Melbourne will host the event”. Perhaps the highlight of the evening was Tim Cahill accepting his award in person. The current Socceroo received his trophy after a standing ovation and a rendition of ‘Super Tim’ fueled largely by the awestruck Everton supporters table. On behalf of the whole team at The Football Sack I would like to thank everyone who voted for us this year. We’ve had a wonderful year in football and hope that you will join us for the 2011/2012 Hyundai A-League season. It truly is amazing to think that there are actually people listening to our podcast and that you then took the time to vote for us as well! Crossbar: Wan. Der. Ers. What are they good for?